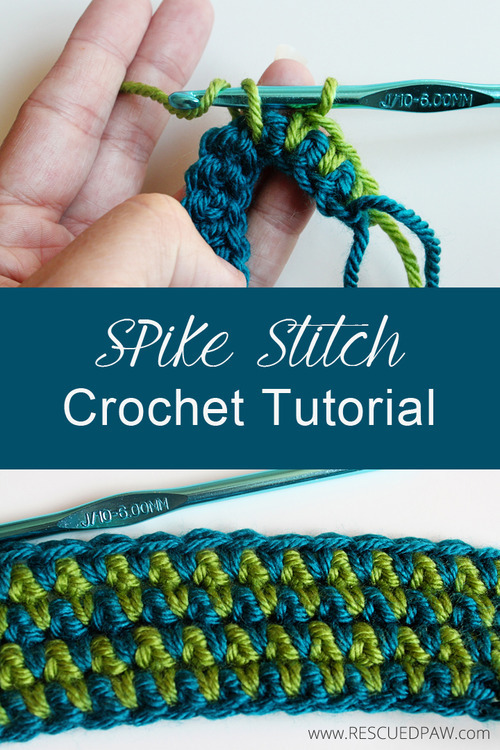 Learn how to make this easy crochet spike stitch tutorial for your next crochet project today! 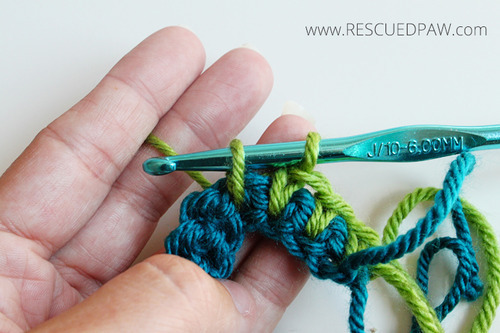 Read on down to find the full, FREE crochet stitch tutorial! 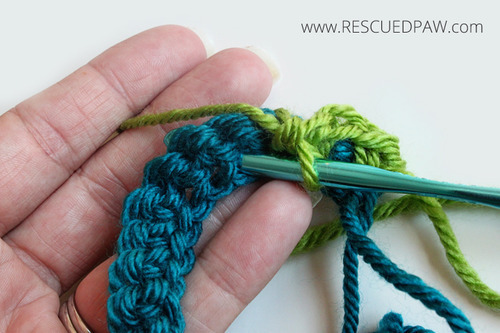 Have you wondered how to make a spike stitch in crochet? 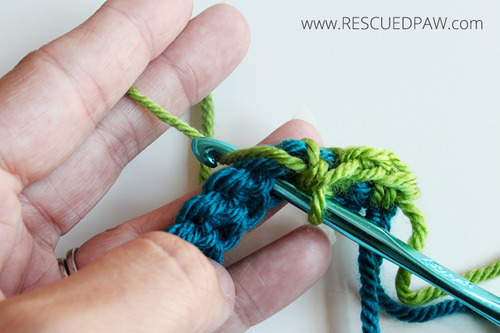 If so then you will love the fact that this stitch is one of the most interesting crochet stitches out there for crochet. 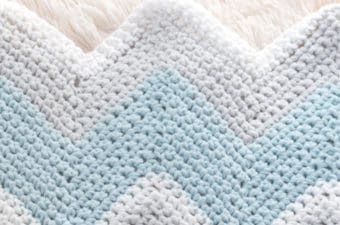 I can promise you it is an easy technique to master and creates an awesome looking texture on your crochet projects! 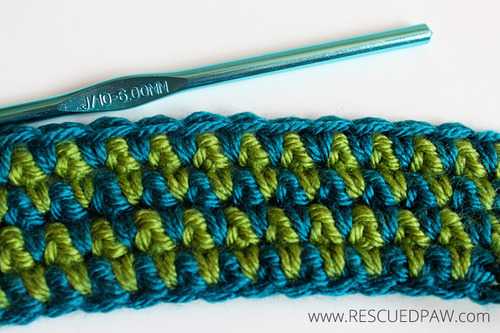 Keep on reading down to find the free spike stitch crochet tutorial! The spike stitch looks great with any color combination! Adding two or more colors to a project always makes it more eye catching. Don’t you agree? I used Red Heart Soft for this sample but you can try it with any yarn you want. 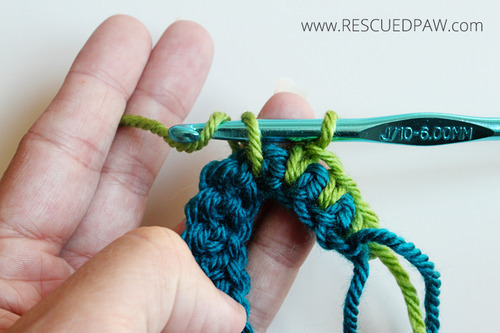 Just make sure to use the corresponding hook to the yarn weight you are using. 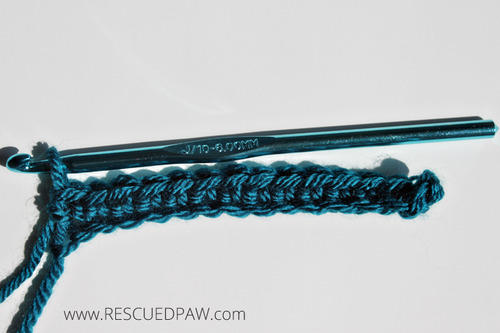 USE The Spike Stitch in BLANKETS, HANDBAGS & MORE! 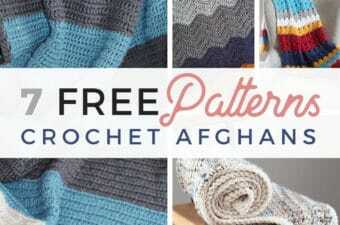 I think this stitch pattern would make a great blanket, handbag or washcloth! I can even envision it as a sweater. I think I need to add all three of those to my to crochet list! 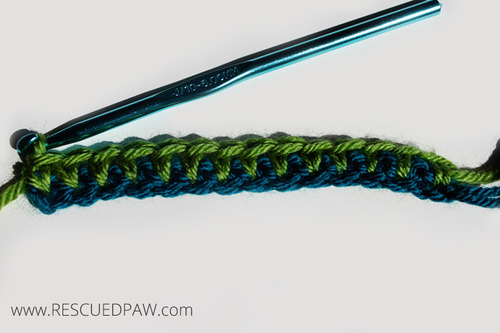 Ready to learn all about the spike stitch? If so keep on scrolling down for the free tutorial and please be sure to ask if you have any questions! Two colors of worsted weight yarn (Color A & Color B) Red Heart Soft Yarn in Teal & Red Heart Soft Yarn in Guacamole. Remember to Chain 1 at the end of every row and turn your project. Chain desired amount in Color A and then starting in the second chain from the hook work a row of single crochets. Change to Color B. (How to change colors in crochet tutorial HERE.) Next, insert hook into the top of the stitch below the current row being worked. Yarn over and draw yarn back through stitch. Pull through the work to the height of the current row you are working on. Yarn over and pull through the two loops on hook. A crochet spike stitch has been created!!! Keep on going until you have completed a row! Always make sure to chain 1 and turn at the end of every row. To achieve the look below do a row of spike stitches followed by a row of single crochets of the same color for a total of 2 rows. You can change colors now by using this tutorial. Alternate colors every two rows to achieve the classic spike stitch look. 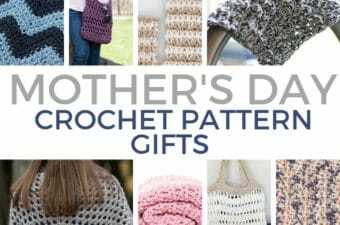 You May Also Like these crochet tutorials too.. 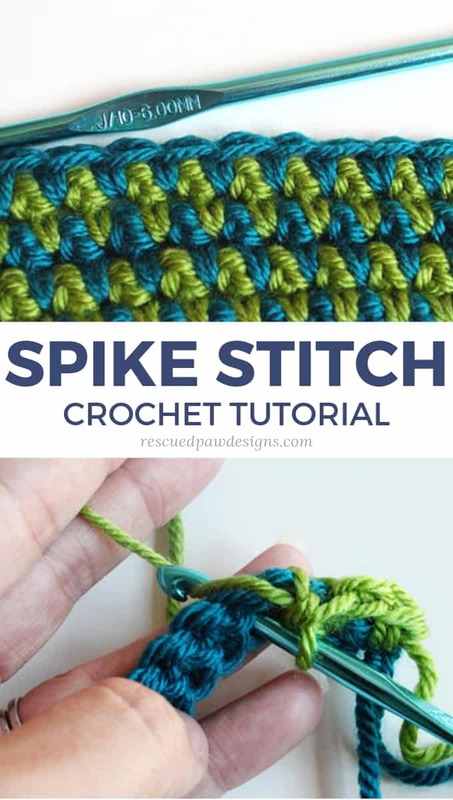 I hope you enjoyed this spike stitch tutorial. Want more tutorials just like this? 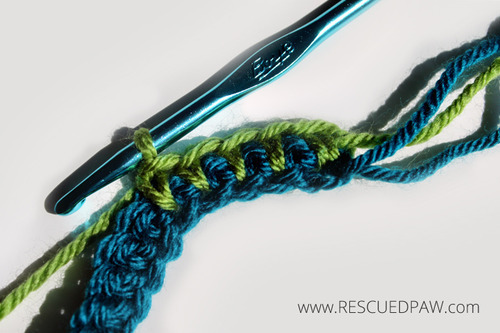 Check out our Primrose Stitch Tutorial and Sand Stitch Tutorial to add even more fun crochet stitches to your library! can’t imagine how to come up with a pattern of my own. This is so pretty! I can’t wait to get my hooks! Thank you for this, you kept it easy. 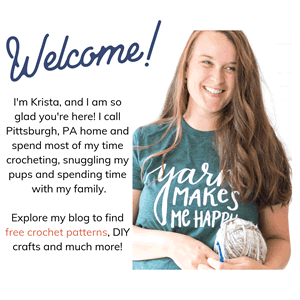 I will explore your site further, but for now I had to tell you, I love crochet AND rescued fur babies too!! I would like to do this in the round. What changes do i need to make for that ? I would like to do this in the round. What changes would I need to make? Hi! I have never tried this in the round so I don’t want to steer you the wrong way but it is definitely something I’d like to try! Can a foundation single crochet work for the start of this project or is it better to do the chain and then the single crochet? I have only ised the fsc once so I’m not sure if it will change the look of the design. Thank you. Hi Krista, beautiful work! I do better with a written tutorial. Is a pdf available for the spike stitch? Hi! I do not have a pdf for this stitch as of right now. I hope to in the future. Why can’t I get the free tutorial to come up for me. When I go to where it say tutorial and tap on it it doesn’ come up. The tutorial is on the page (not an external page). When you scroll down and it stays Spike Stitch I have the tutorial written out with pictures of each step. Happy Crocheting!